Total's Full Ride Scholarship Program! In an effort to attract and retain professional truck drivers to our company, Total Transportation is announcing a new college scholarship program for drivers and their qualified dependents—the first and only of its kind in our industry. Called Total Full Ride, the program offers our drivers and/or their dependents full tuition towards earning a bachelor’s or master’s degree in one of over 50 majors at Ashford University, an accredited online college. Total Full Ride is one more way we’re working to make Total Transportation the preferred employer for professional truck drivers. With Total Transportation Full Ride, any first seat driver with the company can take online classes towards a bachelor’s or master’s degree from Ashford University in one of dozens of majors ranging from liberal arts to accounting to behavioral science. And the best part? Total Transportation is paying for it all up front. Plus, the program extends to drivers’ dependents (children age 17-26) too. In fact, a driver with Total Transportation may have a total of two people enrolled in school at any one time (either the driver and a dependent or two dependents). Student drivers are eligible to participate in the program as soon as they are promoted to a first seat driver. First seat drivers are eligible to participate as soon as they’re hired. There is no waiting period. There is no obligation to remain employed with Total Transportation after the driver and/or dependents finish their degree or stop taking classes. Unlike tuition reimbursement programs, Total Full Ride covers the cost of tuition and fees for our drivers (and their dependents) up front. There’s no out-of-pocket and waiting to be reimbursed with this program. Classes start every Tuesday and most courses are designed to be completed within five weeks. Because our drivers are mobile, they need a high level of flexibility for off-the-job commitments. Ashford offers that flexibility by starting classes every Tuesday, 5-week courses and the ability to take class from anywhere with an internet connection. Ashford’s enrollment process is easy and straightforward with minimal red tape. It offers simple options to choose from and a streamlined interface for signing up and taking classes. We were impressed with Ashford’s list of blue chip companies T-Mobile, HP, and Dell and spoke with several who were complimentary of the level of service offered to their employees. All said, we considered several viable options but believe Ashford to be the best fit to meet the unique needs of professional truck drivers. What is Total Full Ride? 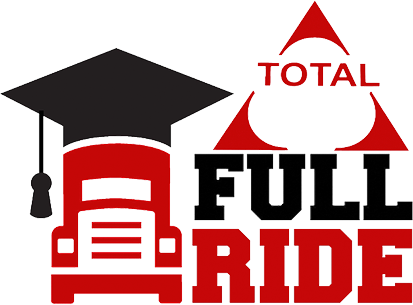 Total Full Ride is a new program that gives company drivers and their dependents the option to take college classes towards earning a bachelor’s or master’s degree at no cost to them. How many dependents can each driver put through school? There’s no limit to how many dependents can participate in the program over a period of time, but only two members of a driver’s family may be enrolled at the same time (the driver + a dependent or two dependents). What exactly is required to be considered a “dependent”? We’re following the same rules the IRS uses when it defines dependents. Spouses are not considered dependents when it comes to taxes and the IRS. If drivers have questions about who would be considered a dependent, they can reach out to the HR Service Center at 844-USXPRESS (Option #7). Are drivers’ spouses eligible to participate? Spouses are not eligible to participate in Total Full Ride. But Total Transportation is working on a program to make significant discounts available for spouses who would like to take classes at Ashford University. What are the costs to the driver for participating in Full Ride? Total Transportation covers all of the costs of the program including tuition, fees and books. The only thing the driver is responsible for is a computer and Internet connection for accessing courses. Do drivers need to commit to stay with Total Transportation after they finish taking classes? Of course we hope they’ll stay! But there is no obligation to remain with Total Transportation after drivers or their dependents are finished taking classes. When may drivers start taking classes? Classes at Ashford start every Tuesday. So, once our driver and/or dependents have enrolled and completed necessary paperwork, they can start the following Tuesday. What drivers are eligible to participate? All first seat company drivers (and their dependents) are eligible to participate immediately. Student drivers (and their dependents) will be eligible to participate as soon as they are promoted to first seat drivers. Independent Contractors are not eligible to participate in the program. Yes, Masters Degrees are available in 11 different subjects. See https://www.ashford.edu/totaltransportation for a full list of Bachelor’s and Master’s degrees offered. What is the eligible age range for driver dependents who want to participate? Dependents ages 17-26 (at the time the dependent begins each class) are eligible. What if a driver wants to take classes but wants to pick a school other than Ashford? At this time, Ashford University is the only option available under the Total Full Ride program. But, if Ashford does not offer what you want, drivers can take advantage of our Tuition Assistance program which is also available to all office/shop employees. Tuition Assistance is not as comprehensive as Full Ride, is not available for dependents, and does have more requirements in terms of tenure for eligibility and commitment to stay with the company, but it is a significant benefit for drivers who want to explore options outside of Ashford. Are signing bonuses still available now that Total Full Ride is in place? Total Full Ride will not have an impact on bonuses or other incentives we offer current or new drivers.